When we last met, I was enraged about the diffidence with which Volkswagen has treated its New Beetle. Kindly note that, since the publication of Dub Chick Be Trippin’, Tracy Morgan’s been profiled in several glossies. It seems that though my perception might have been the harshest, I’m certainly not alone. But that’s ancient history. It was before the Chicago Auto Show media preview, anyway, at which I was reassured that really, not much has changed with VW. Whether I attend several auto shows a year or just one, it’ll feel as if I never left. The New Beetles were holding court at opposite sides of the show floor, proud like Wilbur, the radiant piglet, pre-bacon revelation. The ’10 Red Rock Edition: distinct red, black roof. The ’10 Final Edition Convertible: rather pretty, light blue with cream, capturing the prized retro aesthetic quite well. The Final Edition Coupe and Convertible were introduced at the LA Auto Show, concurrent with VW officially pulling the plug on the Beetle. I was soothed, in a morbid kind of way, to witness an appearance in Chicago. Paradoxically, the term “special edition” seems to go against everything VW stands for, implying that some specimens off the same production line are better than others and should, therefore, be purchased as quickly as possible before availability expires. It was in response to consumer demand, however, that VW released the ’02 337 Edition and ’03 20th Anniversary Edition Golf GTIs, which (to the layman) featured little more than spruced-up interiors, bigger wheels, and in the case of the 20th Anniversary, an exclusive selection of Audi-sourced exterior finishes. Each bore an aluminum number plate to indicate its place in the production queue. Though they’re “just” extra-tarted-up Golfs, they still carry a premium in their niche market and are discussed endlessly in certain circles. Most of the time, though, the move just reeks of desperation, like in the case of VW’s third-gen Jetta and Golf special editions, identified as such by heinous (and rare) cloth seats. Many car manufacturers run special editions to use up stock of premium parts or generate interest in a stagnant model. I don’t think that’s exactly the case here, but the numbers tell a different story: the New Beetle’s 13-year run was spiced up by an average of two special editions per model year. It was particularly suited to this trick, or, depending on your perspective, beholden to this life support. Largely unchanged since its 1998 introduction (save a few minor facelifts and drivetrain upgrades concurrent with VW’s lineup) a kicky new color combination a couple times a year was enough to to justify a press release, perhaps a couple print ads, and a prime spot on the showroom floor. And some of them were pretty freakin’ cool. Who else remembers the 225 hp, 6-speed, $58k (U.S. equivalent) Mexico-issue Beetle RSi, with a build run of 250? A race-inspired Beetle. Yep. Like, really race inspired. As I wrote in the previously-mentioned Rational Bohemian #6, I want to make clear: I’m not criticizing VW for the New Beetle’s life. Rather, I take issue with its undignified death. At the very least, the car deserves a really damned heartfelt thank-you. At best, well, a Sexual Favors Edition wouldn’t be as inappropriate as it sounds. Perhaps special editions worked well because they brought an idiosyncratic feel to a ubiquitous car. VW’s abandoned the pretense of the people’s car, and thus, the New Beetle’s time has come. I guess that’s why it falls on me to write the eulogy. “You of countless cheerful colors, spirit-lifting commercials, hippies reliving the glory days in the newfound comfort of regular paychecks. Your J Mays-designed bubbliness and famous greens inspired The Onion’s fictional columnist, Jim Anchower, to refer to you as ‘globs of snot’ flying around. You inspired me to put a flower vase on the dashboard of my GTI. You came along, and VW actually had to pick itself up by the bootstraps and put forth some effort, because people were suddenly paying attention. Though recognized worldwide, the silhouette alone betrayed none of the charm of the countless special editions; it was a blank slate, and countries across the globe have their own treatments (such as Mexico’s cheeky HotWheels Edition). A short history of the most notable, and how they changed Volkswagen of America. In 2000, VW used the Reflex Yellow and Vapor Blue editions to test the Internet’s sales potential. These eye-catching colors were flaunted on TV, but could only be ordered online, a process that, then, was nearly unheard of. 2002 saw the release of the Color Concepts: Snap Orange, Double Yellow and Cyber Green, marked by a whip of color-matched upholstery stitching inside and coordinating wheel inserts outside. A year later, VW brought forth the ChromaFlares: two lovely flip-flop finishes, turquoise to lilac and silver to green, inspired by expensive custom paint jobs and so rare that a sighting still justifies a double take. By far, they were the most outrageous exteriors in the lineup. Coincidentally, at about this point, the VW family paint palette took a turn toward the dull side. By and large, from the mid-2000s forward, bright colors were a New Beetle exclusive. Remember when factory satellite radio wasn’t yet a basic expectation? It was 2004, and we had the Satellite Edition Beetle, more notable for its sparkly exterior than its audio, modern despite being so thoroughly teal. 2005’s Dark Flint Convertible fit much better with the aesthetic of VW’s grown-up sedans. The exterior was anthracite, the interior had red accents, and the top was deep cabernet. A bit too brooding, but beautiful nevertheless. 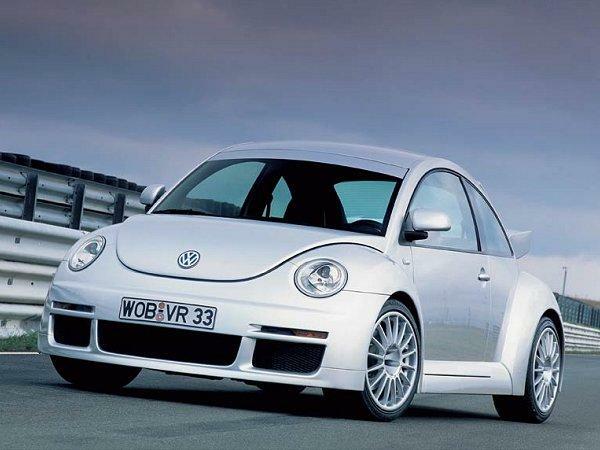 VW went lighter from there on: the throwback Triple White Convertible in 2007, followed by the Coupe in ’08. In case the creamy white interior, exterior and top were too wholesome, the Coupe was released alongside a Black Tie Edition.